Over the course of history man has created an endless amount of memorable moments. History textbooks tend to canonize the bigger moments, events, and figures in history, but sometimes they overlook other astounding events that truly epitomize what was going on at the time. Once that fleeting moment is gone, the only way to freeze it in time and forever etch it into the annals of history is through photographs because they are all that’s left for man to look back, reminiscence, commemorate, and learn from past mistakes. So buckle up as we’re about to launch this unique time machine and explore rare photos you’ll never find in history books. Who is this young woman with the fierce stare? None other than French actress Brigitte Bardot, right before she hit it big (and turned into a blonde bombshell). This photo shows the 18 year old in 1953 while at the Cannes Film Festival for the first time. She was a very new actress on the scene, having appeared in only a few French and Italian films at this point. Only a year later, she would take the film world by storm and become famous for her on-screen persona as a sultry, carefree siren. It was an incredibly warm day in June 1970 when a weary guard of honor fainted during a Trooping the Color ceremony in 1970. The ceremony was in honor of Queen Elizabeth’s birthday (which is actually in April) and she was riding by on horseback when the poor soldier passed out. 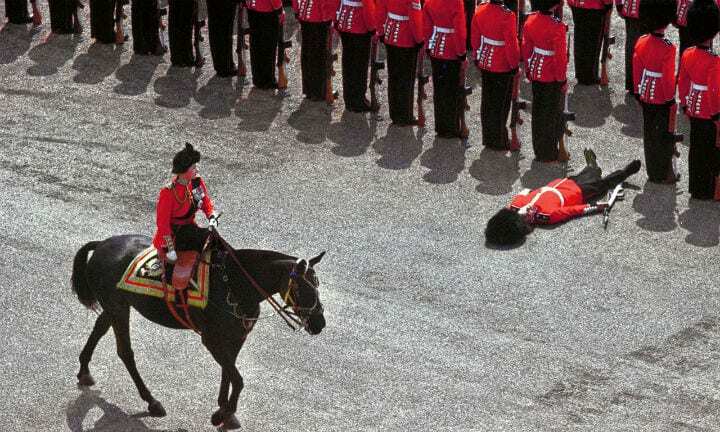 Apparently it is not such a rare occurrence for guards of honor to pass out. In June 2017, it was reported that five soldiers passed out during that year’s ceremony. The weather was about 80 degrees and it can’t be fun to wear a heavy uniform and fur hat. This rare photograph shows Adolf Hitler laughing and enjoying tea with Gertrud Deetz, wife of the Nazi politician Albert Forster, 1937. At the time, demonic mastermind Hitler was in a secret relationship with a woman named Eva Braun. It was kept hush-hush until after their deaths, when they committed suicide in the bunker at the close of World War II. The two were only married for about 40 hours when on April 30, 1945, they bit into thin vials of cyanide and Hitler shot himself in the head with a pistol. They had planned the suicide because Hitler gave precise instructions of how to dispose of their bodies. 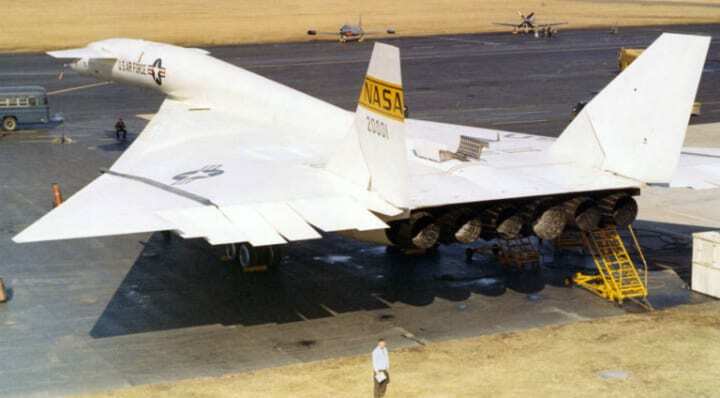 This is a rare image of the six-engined North American XB-70 Valkyrie prototype in the late ’50s, which was supposed to be used as a nuclear-armed strategic bomber by the US Air Force. It was capable of traveling at incredibly-high Mach 3+ speeds for very long distances while also flying at incredible heights. The USAF eventually had to give up on the production of this supersonic strategic bomber and the B-70 program was abandoned in 1961. In its place, two prototype aircraft were designed and given the XB-70A designation. One crashed after hitting another small aircraft in flight. The second prototype is stationed at the National Museum of the United States Air Force. People are used to getting entertainment on airplanes when they fly but this was definitely a departure from the usual. Pictured here in January 1959, a Swedish Airlines stewardess named Birgitta Lindman was called in to inspect the costume of a showgirl amid news that stewardesses would soon be getting shorter uniforms. The year before, in 1958, Birgitta Lindman’s face had become famous after she appeared on the cover of Life Magazine. She competed against 53 other stewardesses from airlines around the world to be the covergirl for the magazine’s special issue. War is hell and the Vietnam War was one in which many went but not as many came back. 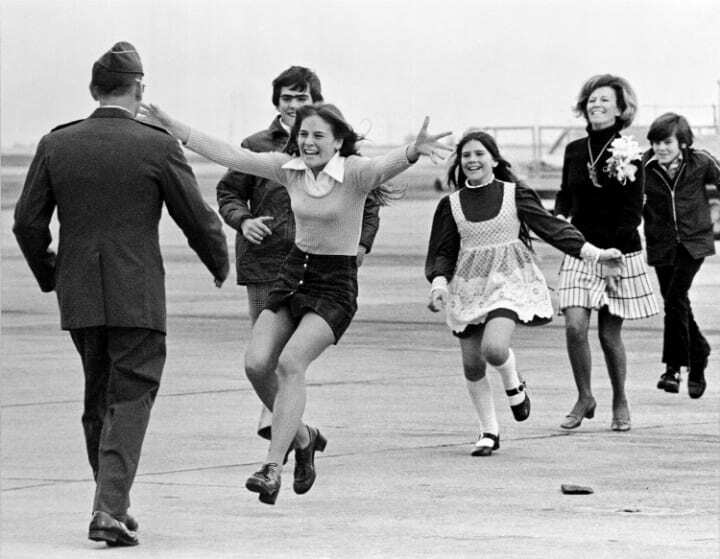 For this reason, the joy couldn’t be more palpable than in this photo of children greeting their father upon his arrival back home in March 1973. Pictured in the photo is Lt. Col. Robert L. Stirm, who was held as a prisoner of war in North Vietnam for five years when his plane was shot down while flying over Hanoi. The photograph has been titled “Burst of Joy” and won AP photographer Slava “Sal” Veder a Pulitzer Prize. Queen Elizabeth II is the reigning queen of England and she is mostly seen at prim-and proper social events. For that reason, this photo from 1993 is so incredible. 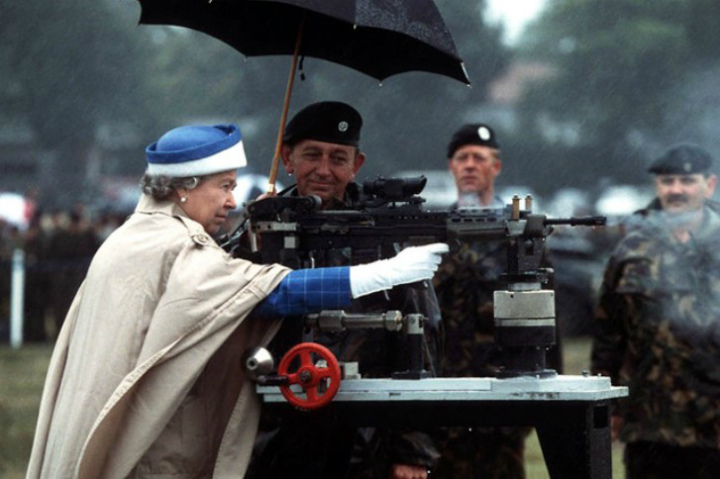 It shows Queen Elizabeth firing a British machine gun called the L85. Military service was nothing new to the queen, however. During World War II, she served in the Women’s Auxiliary Territorial Service. “Subalterm Elizabeth”, as she was referred to, was as a driver of military trucks and a mechanic. At the moment, she’s the only head of state in the world that was in the military during the Second World War. 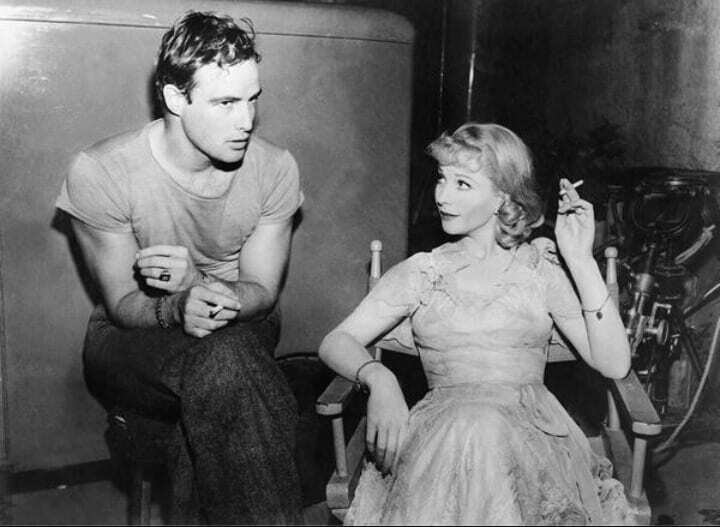 Captured here taking a break are actor Marlon Brando and British actress Vivien Leigh while they were filming the now-classic 1951 film A Streetcar Named Desire. The movie is especially renowned for it’s famous “Stella!” scene. Brando’s role in A Streetcar Named Desire put him on the map. At this time in their careers, Vivien Leigh was one of the biggest stars in Hollywood and won an Academy Award for her role in this film. Meanwhile, Marlon Brando was a relative newcomer to the scene, having appeared in only two movies before this. The date and exact details of this picture are unknown, but this rare shot captures a man on the top of what seems to be a moving USS Queenfish Balao-class submarine. The sub was named after a small fish called the queenfish, found in the Pacific coast of North America. This fast attack submarine was one of the fastest and quietest submarines during the Cold War, designed with big passageways so that the crew could get from one end to the other quickly. This crew member might have taken the easy access part a little too seriously! This group looks like they’re having so much fun, an uninformed onlooker would hardly know that they were in the middle of a heated political campaign! 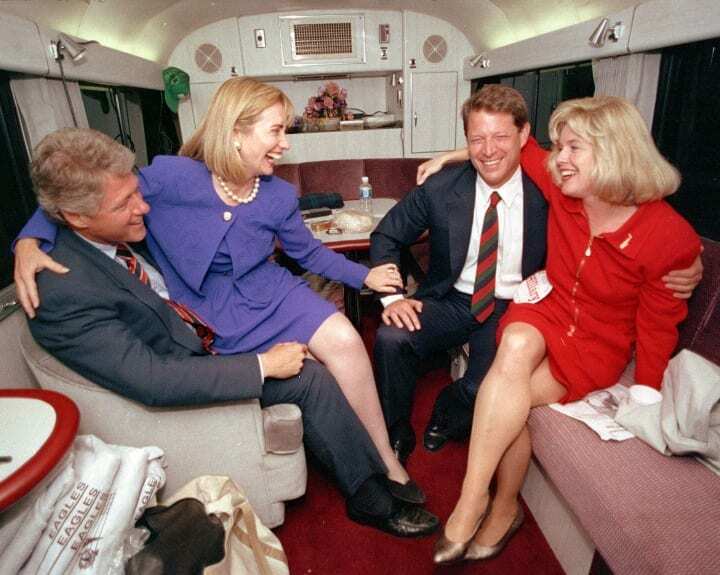 Yes, pictured here are Bill Clinton, Hillary Clinton, Al Gore, and Tipper Gore. Who knew campaigning could be so fun. The photo was taken on October 26, 1992 while taking a break from campaigning in North Carolina. Only eight days later, the nation voted and elected Bill Clinton as the 42nd President of the United States, making Hillary the First Lady of the United States. In the late ’70s, Rolling Stone magazine chronicled the phenomenon of single people working out at health clubs in Los Angeles. Pictured here is the famous actress Jamie Lee Curtis in a very-retro pink leotard and workout gear, just ready to get down to business. It was for the 1985 movie Perfect, directed by James Bridges and based on the Rolling Stone articles. The idea that health and fitness clubs replaced bars as the ideal place for singles to mingle fascinated Bridges and compelled him to create a movie with his own take on the matter. In 1967, the Vietnam War was raging and claiming tons of lives. In the middle of it all, the US sent film and music stars to perform for the troops and provide a much-needed morale boost. This photo shows a few GIs onstage dancing with actress Raquel Welch in South Vietnam during a USO tour. Heading this USO Entertainment tour was legendary comedian Bob Hope and this particular performance was part of a visit to the 9th Infantry Division. Let’s hope it cheered those war-weary soldiers up for a little while, or in Hope’s case, a very large laugh. French actress really stole the spotlight when she made her debut at the 1953 Cannes Film Festival and it’s easy to see why she was one of the era’s It Girls. Her carefree beach bombshell attitude carried through on and off screen, as this photo demonstrates. The year before her spectacular debut at Cannes, Bardot had appeared in only three films: Le Trou normand; Manina, la fille sans voile; and Les dents longues. Even in her early years, these films showed that she had incredible talent and she continued to prove this later on in her career. The ’70s were all about those roller skates. It was the era of glitzy, glamorous roller discos and even more, the confident roller girls and boys who ruled the rinks. Rollerskating became such a fad that even kids joined in on the fun! Pictured here is a girl rollerskating with a few kids, showing them how to really stay cool on or off the rink. Their attire really screams “summer”. And we’d have to agree, there’s no better activity for a sunny summer day. We only realized how great the Tonight Show was when Johnny Carson retired in 1992, which is why this image of Carson and Robyn Hilton on the show in 1974 is so epic. After all, he entertained many on the show three decades. But did you even recognize Hilton. If not, she is an American actress and model renowned for the small supporting role she played in satirical Western film Blazing Saddles. She joined the show as a guest back in 1974, when the phrase “blonde bombshell” is rumored to have been coined. 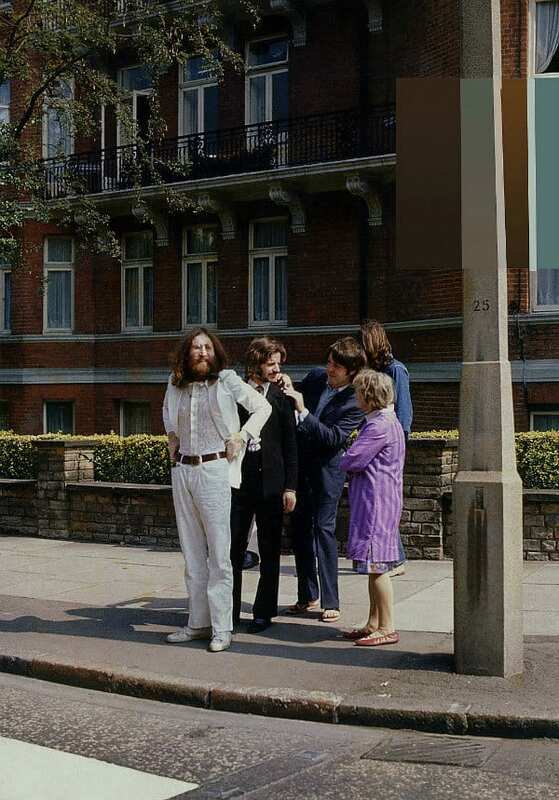 On Friday August 9, 1969, The Beatles gathered at EMI studios for the most famous photo shoot of their career – the cover for their last album Abbey Road. Before Iain Macmillan photographed the men striding across Abbey Road, Linda McCartney took several photos of the group preparing themselves and waiting outside the studio to begin shooting. Policemen held up the traffic as the four legends crossed the street and walked away from the studio, symbolizing the end of an era. Macmillan took six shots of the men crossing the zebra crossing on Abbey Road in London and chose the fifth one because it was when all four Beatles were walking in sync. It would be hard to argue who was hotter back in the ‘70s – “Jungle Jim” a.k.a. Jim Lieberman and his rubber-melting wheel stands or “Jungle Pam” in her shorts and go-go boots? While Lieberman was arguably one of the most iconic drag racers in history, his sassy sidekick was just as memorable. When Jungle Jim hired the tall 18-year-old Jungle Pam, it was definitely the perfect marketing move for himself, but what he didn’t know was that she would give him a run for his money with her knowledge about cars and mechanics. The fans went wild for her, and she is still a legend today. Pictured here is a woman seated on a VMTB-234 aircraft. While not a great deal of information is available as to who she is or the exact date this snap was captured, it is definitely a rare and intriguing shot of a famous plane from World War II. In 1942, the Marine Aerial Refueler Transport Squadron 234, which used this kind of plane, was based at a United States Marine Corps air station in Oahu, Hawaii, seven miles west of Pearl Harbor. In November 1943, the Squadron relocated to an air station in California and was renamed the Marine Torpedo Bombing Squadron VMTB-234. Between the years 1911 and 1913, the British sent an expedition to Antarctica for what came to be known as the Terra Nova Expedition. 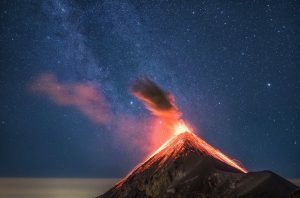 The trip had several geographical and scientific objectives and this photo was definitely one of the most astounding of the ones taken. 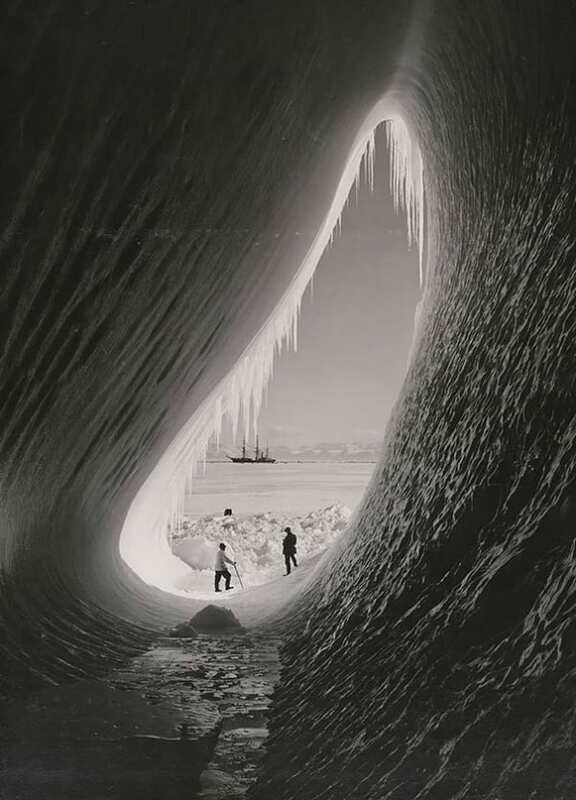 This picture was taken on January 5, 1911, and portrays a grotto that formed in an iceberg. The image shows the sheer power of nature and provides interesting perspective. The men inside the iceberg look so small compared to the surrounding ice. This powerful image demonstrates the futility of war. 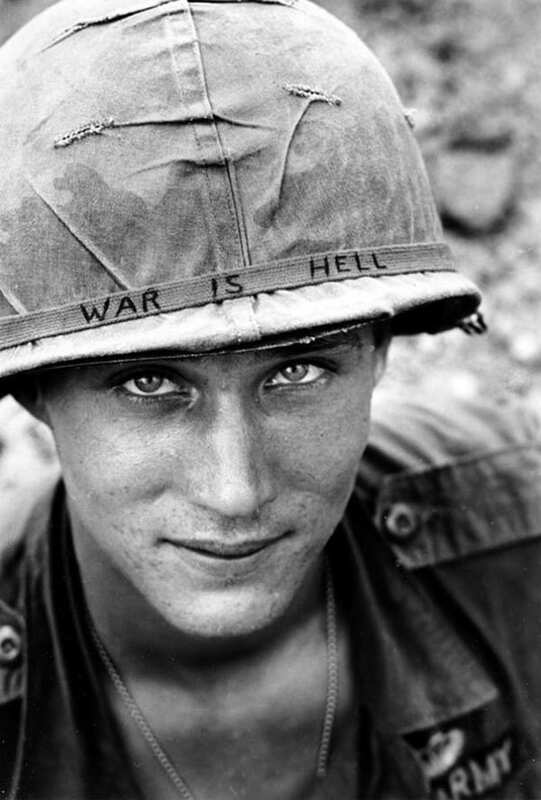 His helmet reads “War is Hell,” an extremely powerful political statement for a soldier who is supposed to be patriotic. During the Vietname War, many soldiers placed slogans on their helmets as a sign of protest. Photojournalist Horst Faas captured this iconic photo in 1965 when the 173rd Airborne Brigade Battalion was on defense duty at the Phouc Vinh airstrip in South Vietnam. Many young American soldiers opposed the U.S.’s involvement in the war and didn’t want to fight a terrifying guerrilla war. The photographer and film producer Sam Shaw captured a series of black and white photographs of the iconic Marilyn Monroe in New York in 1956. 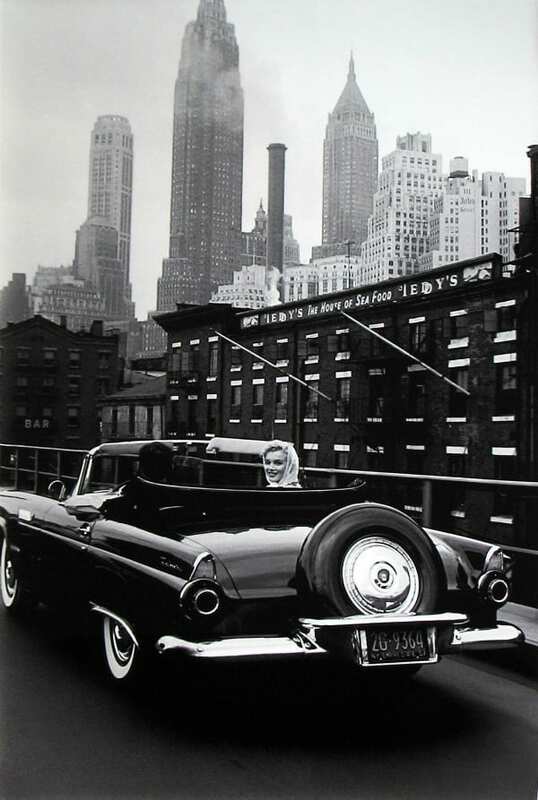 Many of the photos were shot in Central Park and Fifth Avenue, but one of the best was of Monroe and husband Arthur Miller cruising through NYC in a brand new 1956 Ford Thunderbird convertible. Shaw was close to Monroe, allowing him to capture natural, relaxed, and playful images of the star. In January 2014, Newsweek published a special issue of Marilyn’s photographs based on a lost scrapbook she owned. The scrapbook included a love note penned by Monroe to Shaw. 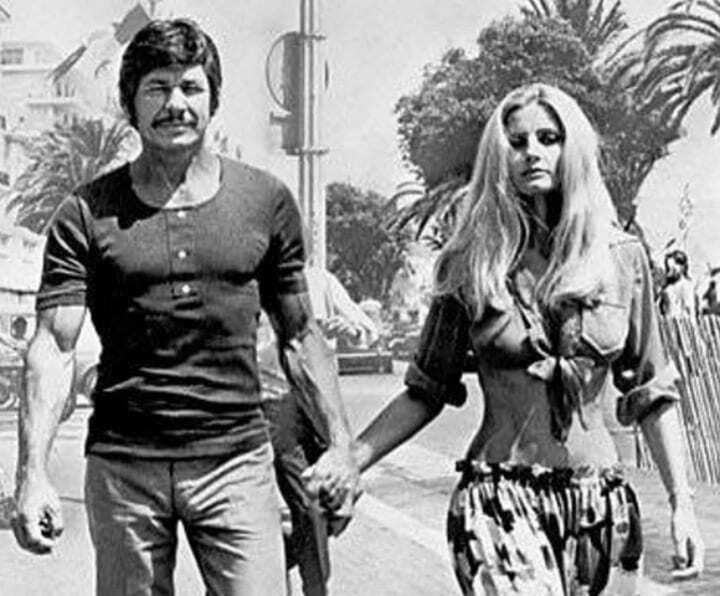 Captured here is actor Charles Bronson, best known for his onscreen gunfighter, vigilante, and police officer antics, hand-in-hand with his second wife Jill Ireland, also a powerful actress. . The picture was snapped back in 1971 in Santa Monica, California portraying the formidable pair. Bronson and Ireland co-starred in no less than 15 films together. Ireland even once joked about it saying, “I’m in so many Charles Bronson films because no other actress will work with him.” Now that’s what you call a power couple. 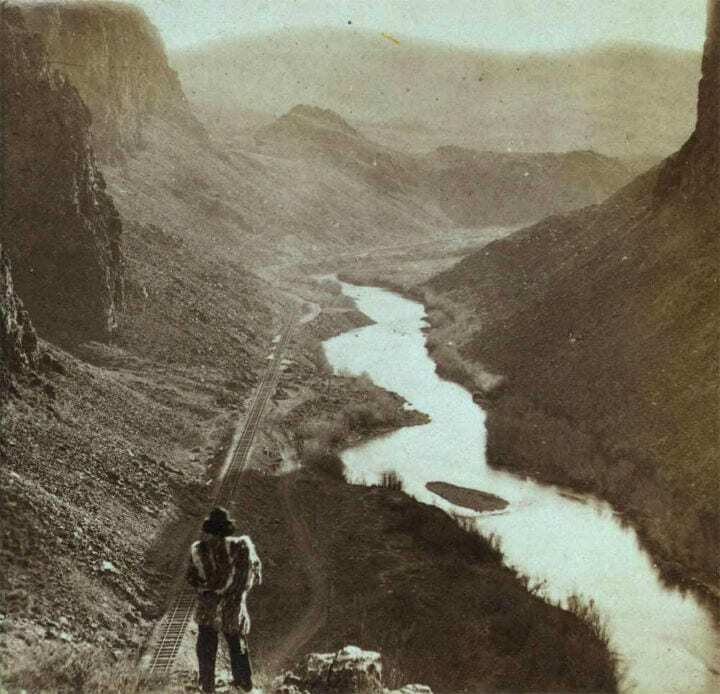 Captured here is a Native American standing upon a hilltop in 1868 gazing over the landscape and the completed Transcontinental Railroad in Nevada. The Native Americans might have signed over the right to their land to the federal government through a series of several treaties, but they definitely didn’t anticipate that the Railroad would pierce through much of their traditional hunting grounds. The construction of the Transcontinental Railroad system had a dire effect for the native tribes living across the Great Plains. The construction destroyed a lot of the landscape and killed a lot of the game, particularly bison, the tribes relied on for food, fur, clothing, and more. Purse Those Lips for Me! Contrary to popular belief, the Victorian era wasn’t all just prim and proper. In fact, your average Victorian person liked to goof around and get silly in order to deal with all those rigid rules. When they weren’t pursuing religious endeavors or campaigning for social and economic change, they were probably making duck faces for the camera, like this woman. Whether you love it or hate it, the duck face seems to have been around since the 1800s, proving nothing is new under the sun. Just because serious portraits were a commonplace marvel of the era, it doesn’t mean that this woman didn’t feel playful in between all the solemn posing she had to do. Now, Let Me Take a Selfie! If you thought selfies were new, think again! 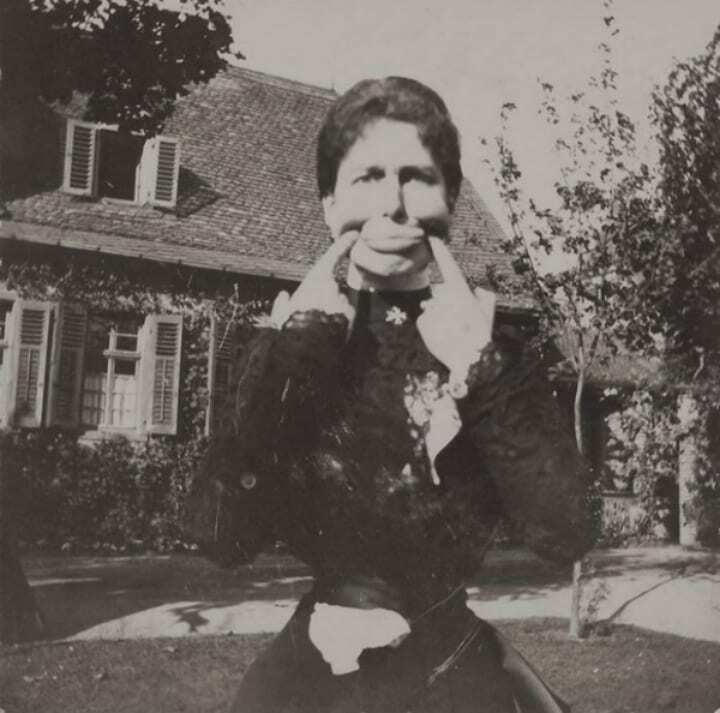 It turns out that selfies were around during the Victorian era and this woman captured one of the world’s oldest selfies as she posed in front of the camera and snapped a picture of herself in 1900 . It shows that it really is true that “nothing is new under the sun” and this incredible shot proves how even in the Victorian era, the digital-age psyche already existed, a century before smartphones were even a thought. 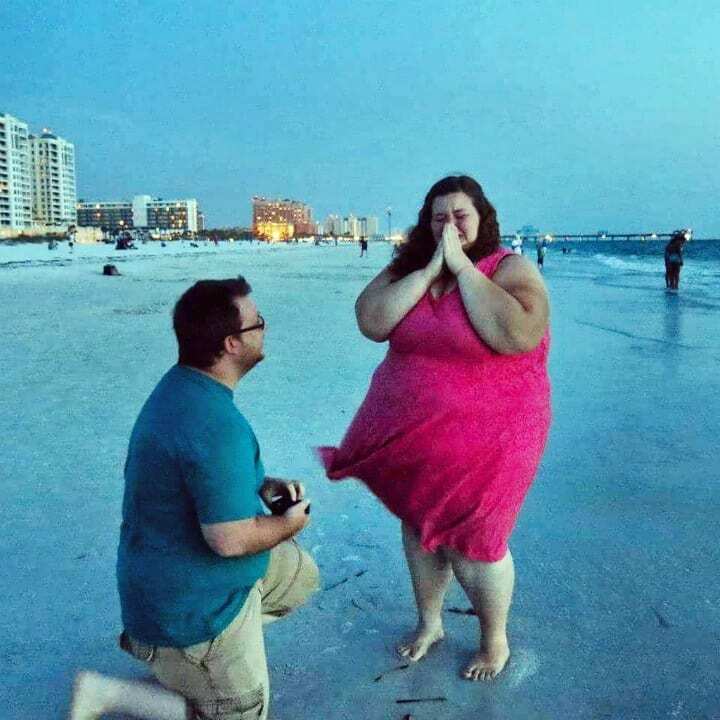 Little did she know, but she would be setting a gloabla trend. This captivating photograph captures Liz Dane and Queenie in action doing their famous skiing act. They often appeared on TV shows, at circuses, and at state and county fairs around America where they would ski while Dane danced and played the harmonica. Dane often emphasized that Queenie loved skiing and wasn’t being mistreated. 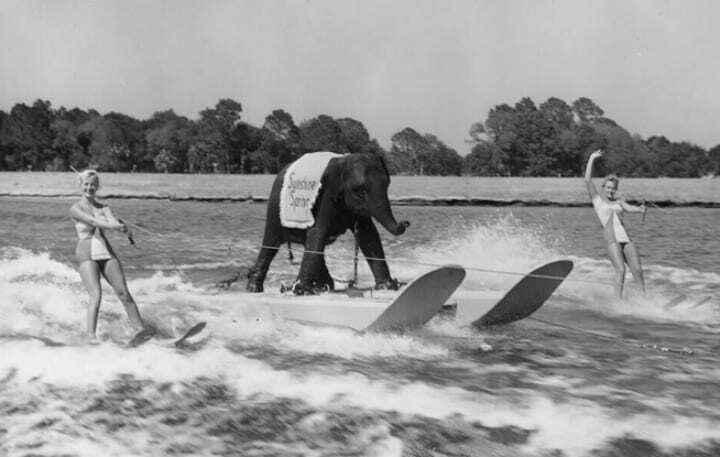 Noted for her water skiing entertainment skills, Queenie started life as a captive female Asian elephant. 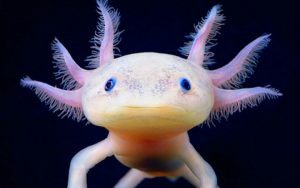 When she turned six months old in 1953, Bill Green and his daughter Liz Green Dane bought her from Trefflich pet store in New York City. Queenie was later taken to a private zoo in Fairlee, Vermont. 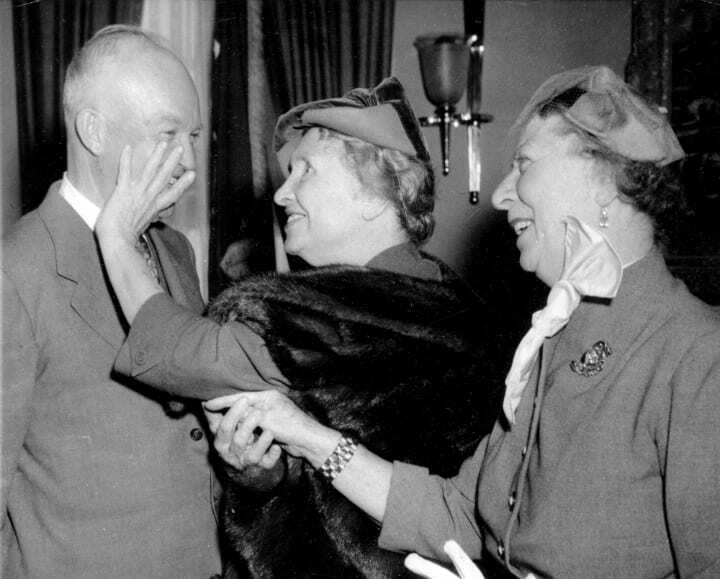 This poignant image captures Hellen Keller’s meeting with President Dwight Eisenhower on November 3, 1953. It certainly must have been the most unique greeting Eisenhower ever experienced with Keller examining his face with her hands instead of shaking his hand. 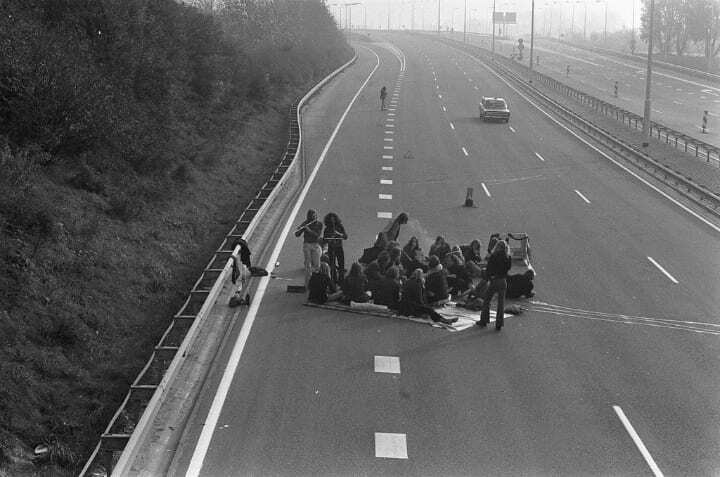 Captured here is a group of people picnicking on a deserted highway in the Netherlands on November 4, 1973 during the Great Oil Crisis. Even though times were bad, it didn’t stop people from having a good time with some hookah pipes and an instrumental accompaniment to lighten the mood. The 1973 oil crisis started in October 1973 when the Organization of Arab Petroleum Exporting Countries launched an oil embargo targeted at the nations that offered Israel support during the Yom Kippur War. The initial nations that were targeted were the Netherlands, United States, United Kingdom, Canada, and Japan. The embargo later extended to Portugal, Rhodesia, and South Africa. 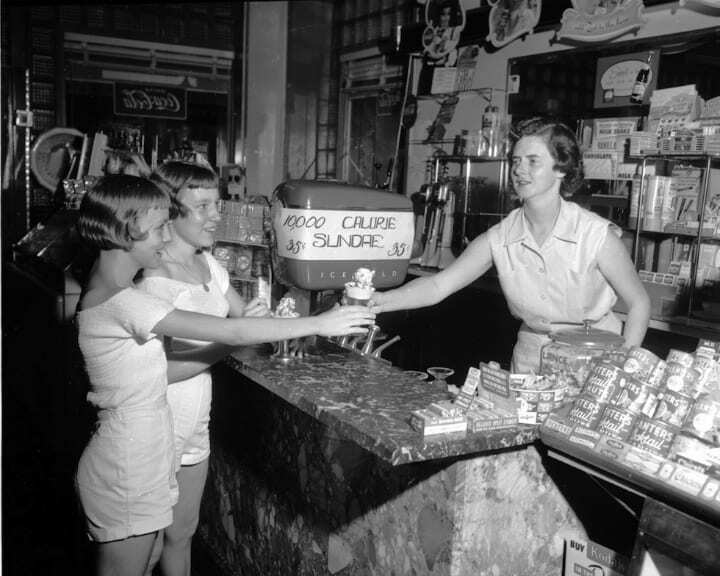 Whether it was a marketing gimmick by Blair Parson’s store or not, the “10,000 Calorie Sundae” ice-cream really hit the right spot for residents of Lynchburg, Virginia in the ’50s. These young girls are pictured in the store just moments before enjoying their tantalizingly tongue-teasing experience. Blair Parson’s store sold this ice-cream for 35 cents, making this sweet treat a definite win. Odds are that it was probably just a marketing scheme because your average hot fudge sundae contains around 280 calories. 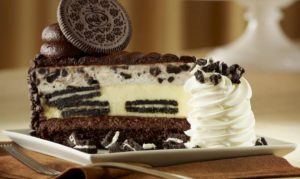 Nevertheless, by the looks of things, those amount of calories really seemed worth it. 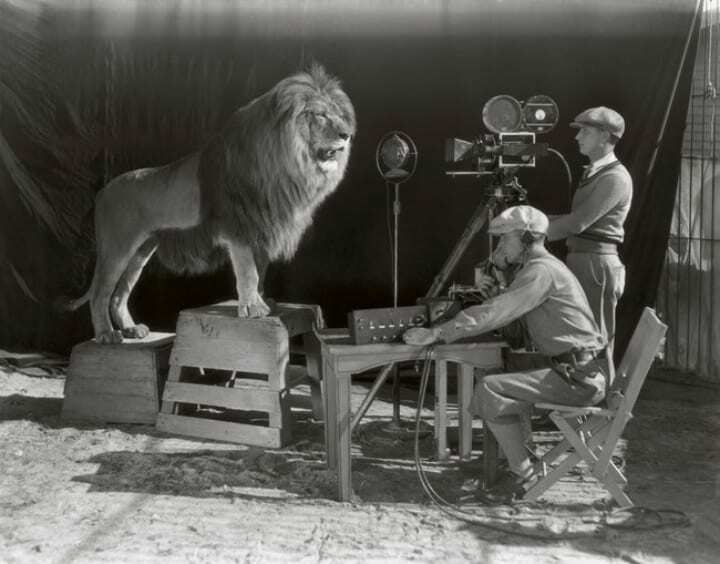 Movie studio MGM (Metro-Goldwyn-Mayer) refers to its opening credits mascot as Leo the Lion and this fantastic shot shows the recording of the iconic lion’s roar for MGM’s first talking movie White Shadows in the South Seas, released in 1928. The crew set up a sound stage around the cage of the lion, whose real name was Jackie, in order to record his roar via gramophone, and MGM went on to use this particular logo and recording from 1928 to 1956. Jackie’s trainer Mel Koontz was on set to ensure that the recording went smoothly. This awesome photograph shows just exactly what it was like working at Disneyland in 1961. Playing dress up was completely normal, and the cafeteria was the perfect place for Snow White and Goofy to meet for a quick and sneaky date. 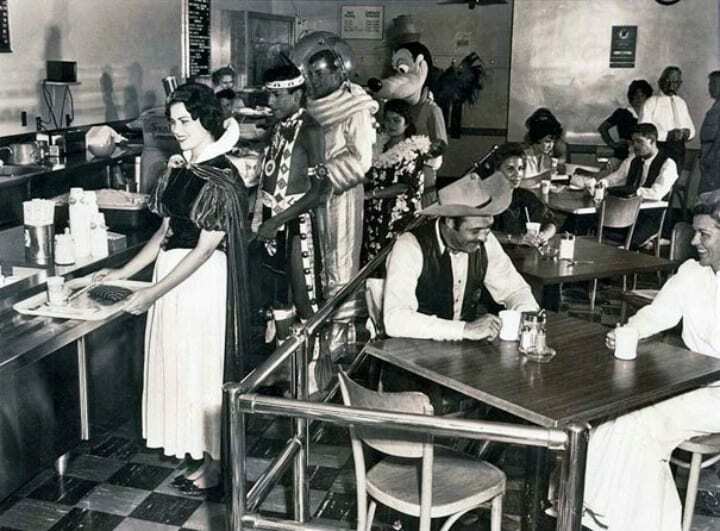 The Disneyland staff cafeteria looks like any child’s dream, but we hope the astronaut took his headgear off to eat. At the time, Disney had an employee manual which included a code of ethics for staff of the “happiest place on earth”. The best section was on how to keep an honest smile. Everyone seems pretty content over here! This intriguing photo captures the very last launch of the American Grumman F-14 Tomcat fighter jet off the USS Theodore Roosevelt aircraft carrier on July 28, 2006. 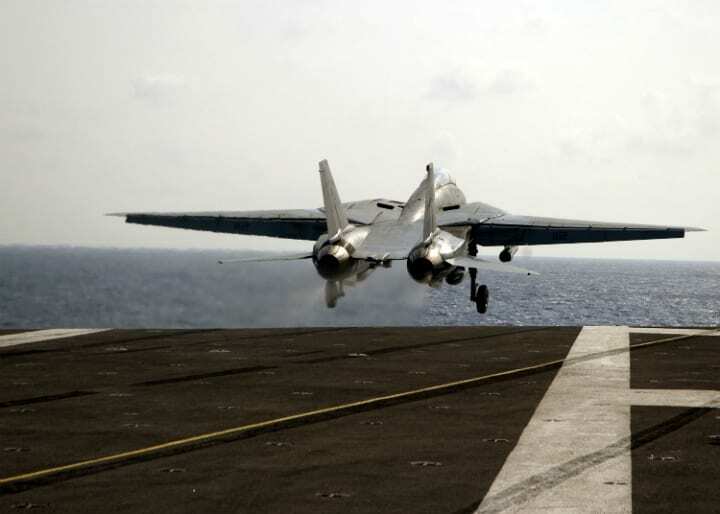 It was monumental because this takeoff marked the end of an era for the U.S. Navy. This aircraft was created for the U.S. Navy’s Naval Fighter Experimental program to combat Russian MiG fighter jets during the Vietnam War. It was retired in 2006 and replaced by the Boeing F/A-18E/F Super Hornet. During its time in use, it proved to be a fierce fighter jet. The year was 1916 and the location somewhere in Northern France, but this image isn’t exactly what it looks like. Captured here isn’t an apocalyptic image, but rather a group of British soldiers keen to play a game of soccer. 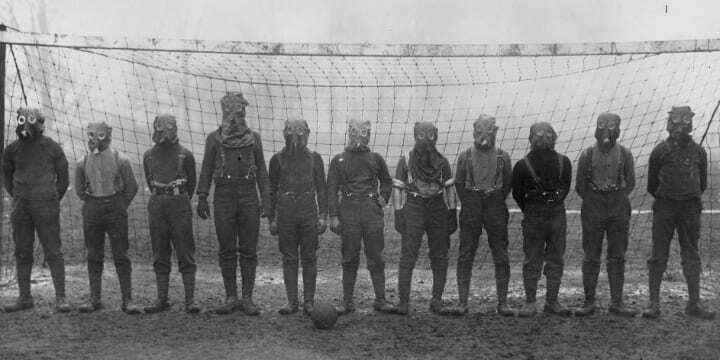 They didn’t want to take any chances with the grave threat of chemical warfare looming about during World War I, so they decided to sport some gas masks during their leisure time. Their concern was very legitimate as by the end of the war, more than 50,000 tons of chemical warfare agents were used by both sides. 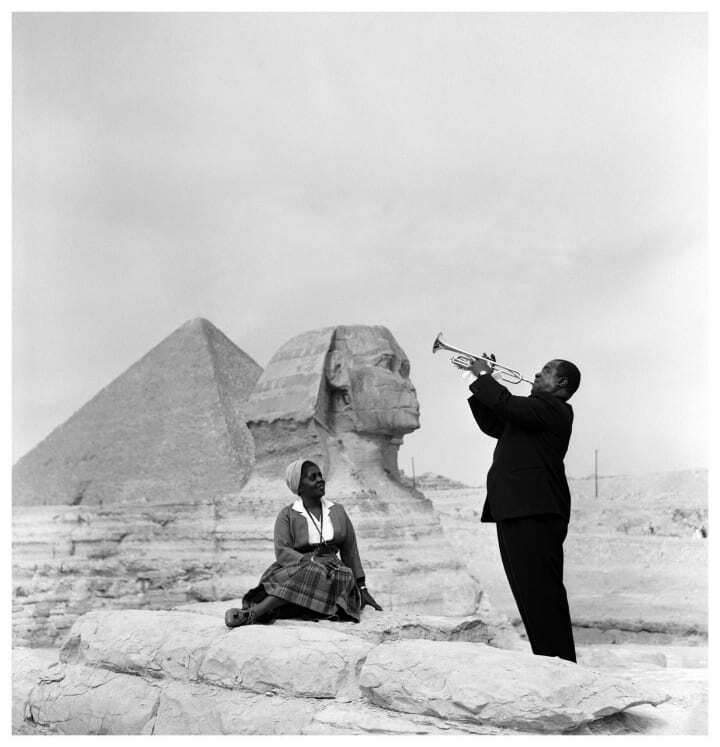 In 1961, the New York Times published a photograph of the trumpeter Louis Armstrong’s trip to Egypt, where he serenaded his wife Lucille while she sat in front of the Great Sphinx and pyramids of Giza in Egypt. During the Cold War the United States wanted to promote the American way of life, so many jazz musicians were sent around the world to showcase the country’s successful music. During a visit to Poland on June 8, 1972, Fidel Castro enjoyed a game of basketball with university students of Wisła Kraków. The dictator was a passionate player of the game even though the de facto national sport of Cuba has always been baseball. 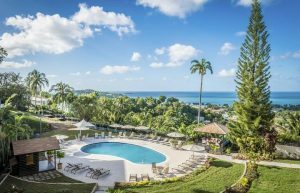 Castro was a fiercely competitive player during his high school years at El Colegio de Beléna in Havana, where he dedicated a lot of time to the sport as well as baseball, table tennis, and track and field. For Castro, basketball was much like guerilla warfare in that it entailed agility, speed, and stamina. It is forbidden for anyone to take photos of the Supreme Court in session and even to this day, the policy remains in place. 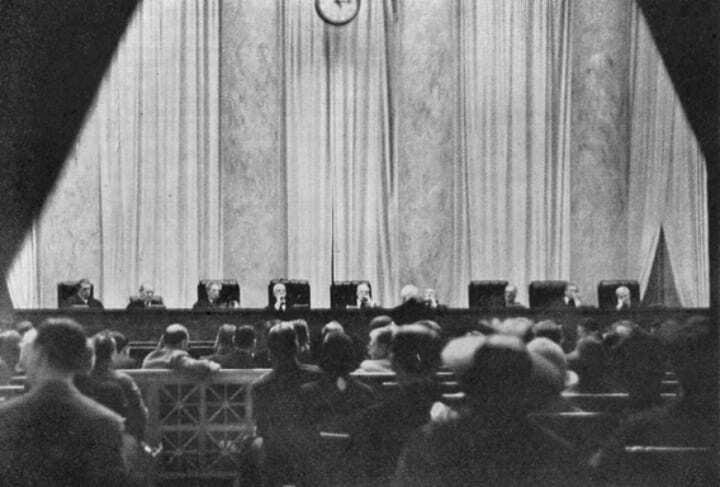 However, this rare image somehow managed to capture a Supreme Court session in 1937. But how? A young woman snuck a camera in the court by cutting a hole in her handbag so that the camera lens could peep through. In 1932, the photojournalist Erich Salomon was the first to sneak a camera inside the Senate. He faked a broken arm in order to hide a camera in his sling. 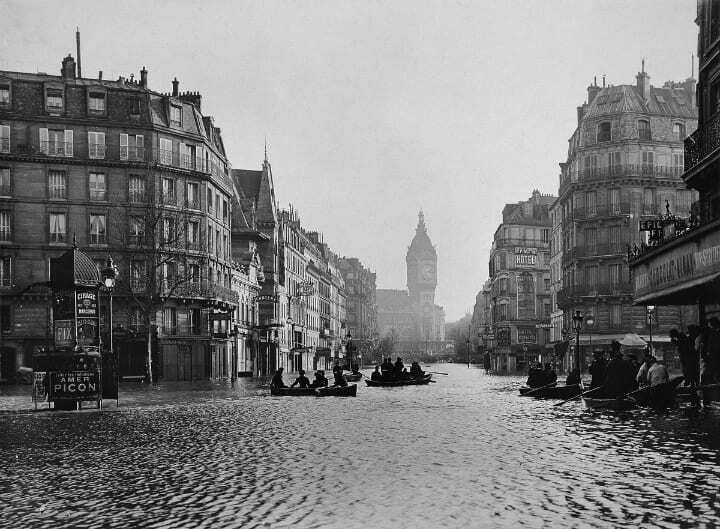 During the Great Flood of 1910 when the deluged Seine River flododed Paris, the streets weren’t bustling with pedestrians getting on with their daily ventures, but instead commuters who took to using boats to make their way around the city. The Seine River rose eight meters above the ordinary level after heavy rainfall, resulting in a catastrophe that lasted the entire winter of 1909-1910. Police, soldiers, and firefighters had to row in boats through the waterlogged streets in order to save stranded residents who needed medical attention or were stuck in second-story buildings. This high-wire artist used the decimated city of Cologne, Germany as the backdrop to show off her acrobatic skills. During the war, the city was bombed in 262 air raids, but the most notable attack was in May 1942 when the Allies dropped 1,000 bombs on the city. This photo, captured in 1946, portrays the devastating aftermath of war resulting from the attacks on the city and the bomb-stricken city formed quite the contrast for this tightrope walker’s daring feat of entertainment, making it one of the most interesting historical photos. 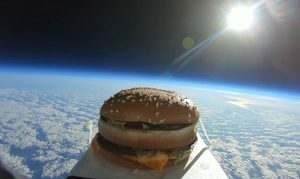 Before Neil Armstrong lifted off to outer space and made his small step for man, he feasted on a wholesome breakfast. 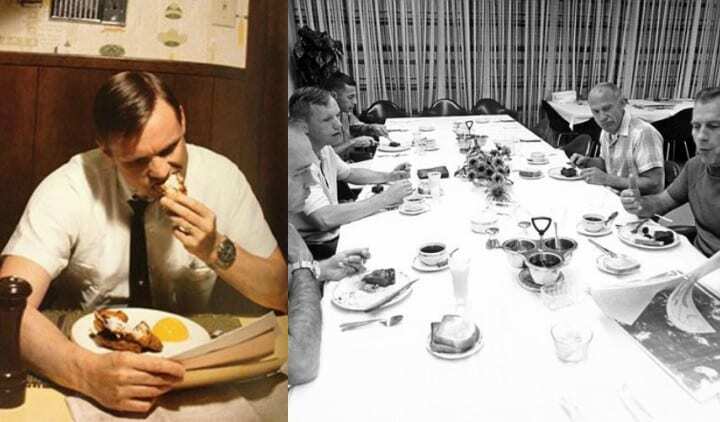 However, he didn’t eat fried chicken and canned peaches before the Apollo 11 mission, like this image on the left that went viral on Reddit portrays. NASA revealed that Armstrong actually ate scrambled eggs, steak, toast, coffee, and orange juice with the rest of the crew, pictured on the right on July 16, 1969. 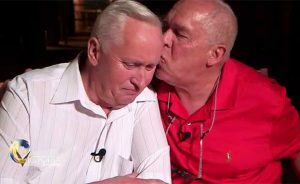 He was joined by fellow astronauts Buzz Aldrin and Michael Collins, as well as Donald Slayton, the director of flight crew operations, and the lunar module pilot William Anders. 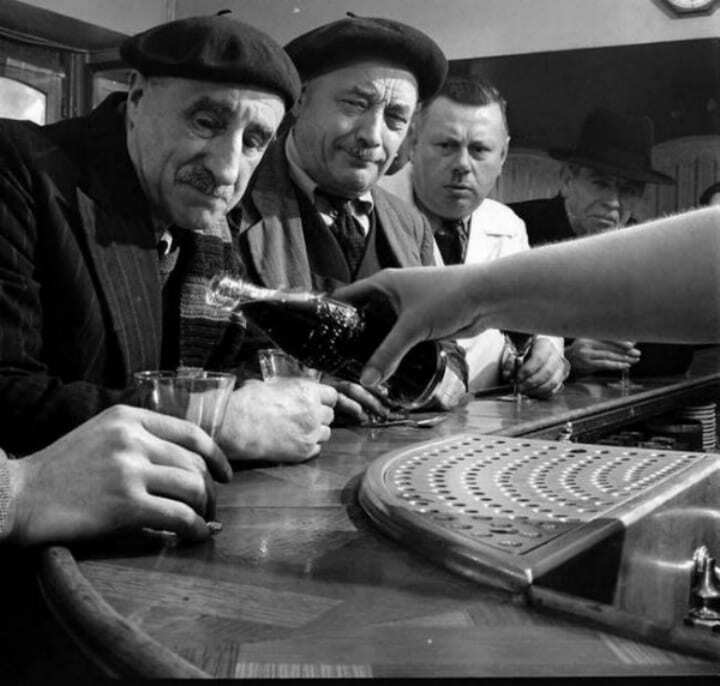 In 1950, the Coca-Cola Company believed that France was finally ready for the iconic sweet black liquid, and so it launched a marketing campaign targeted at the French. The drink was actually unofficially available in France since 1919 and officially in 1933, but in 1950, Coca-Cola went full throttle with its marketing. The company launched a campaign with the slogan “Drink Fresh,” which vans on city street brandished. Salesman distributed samples to adults and children alike in what is now knows as La révolution du froid” (The cold revolution). 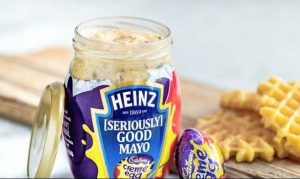 These men look pretty impressed and engrossed just before trying some of this goodness. Those piercing blue eyes belonged to Archduke Franz Ferdinand of Austria. His shocking assassination in Sarajevo, Bosnia on June 28, 1914 triggered Austria-Hungary to declare war against Serbia, which in turn led to the start the devestating World War I.
Gavrilo Princip, a member of a group called Young Bosnia, assassinated Archduke Franz Ferdinandand his wife Sophie, Duchess of Hohenberg. This colorized image of the Archduke might not portray it, but he was described as a dark, uninspiring, violent, and reckless man. It was a film literally of biblical proportions — The Ten Commandments, released in 1956, told the Bible’s story of Moses and the exodus of the Israelites from slavery in Egypt. It can veritably be called the crown jewel of Cecil B. Demile’s career: it was his last, most expensive, and most successful film. Ever since 1973, the movie has been rebroadcast on ABC around the Easter and Passover holidays. 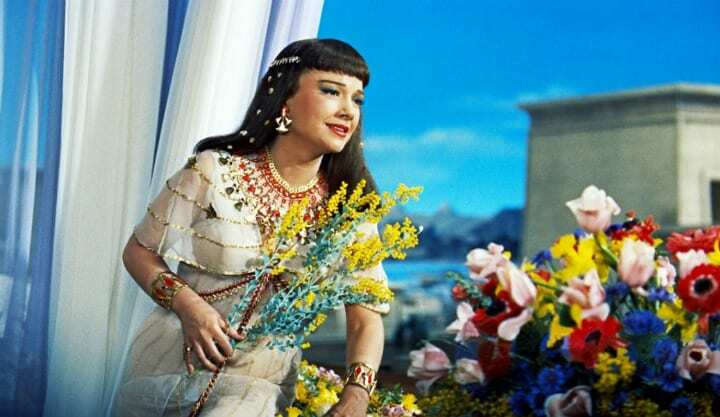 Pictured here is actress Anne Baxter, who played Nefretiri, queen of Rameses II. Her costumes in the film were exquisitely designed and decorated (though not necessarily historically accurate). The British-Italian photographer Felice Beato took this photo of a Japanese Samurai all the way back in 1870. He moved to Yokohama, Japan in 1863 and ran a commercial photography studio with fellow photographer Charles Wirgman called “Beato & Wirgman, Artists and Photographers”. Beato captured rare photos of the Edo period of Japan as well as portraits of Japanese people, landscapes, and cityscapes, as well as a series of photographs that depicted the sites and scenery of Tōkaidō Road. He particularly liked photographing Samurai military mobility in portrait-style images. 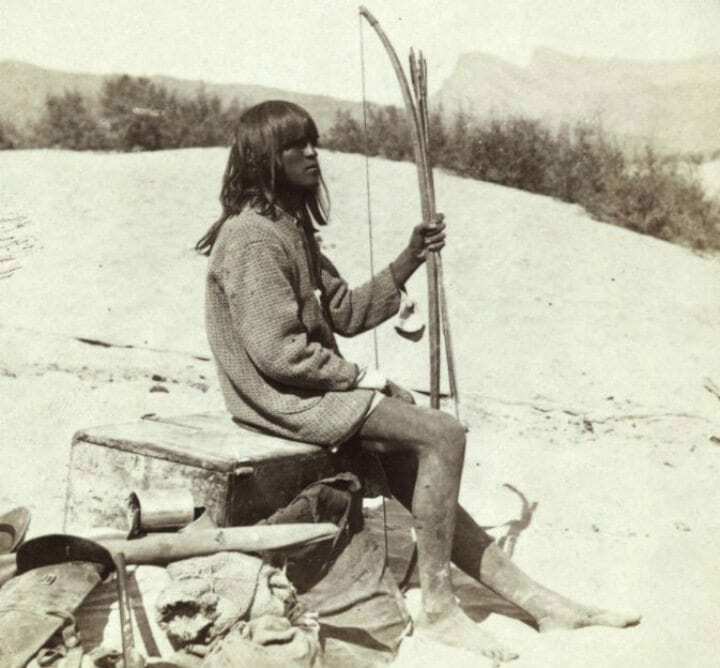 Timothy H. O’Sullivan snapped this raw and charming picture of Maiman, the Native American guide and interpreter from the Mojave Desert in the 1870s. Maiman would often guide O’Sullivan and take him to the ideal spots to snap his photographs. O’Sullivan preferred to take natural photos of the locals in order to seize a very realistic portrayal of life in the region at the time. Besides for his work in the Western United States, O’Sullivan was also renowned for his shots of the Civil War battlefields. 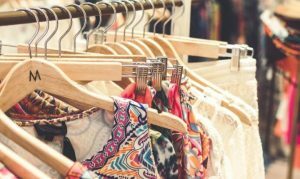 To most people, a supermarket is a place bustling with consumers perusing overflowing amounts of food and items. 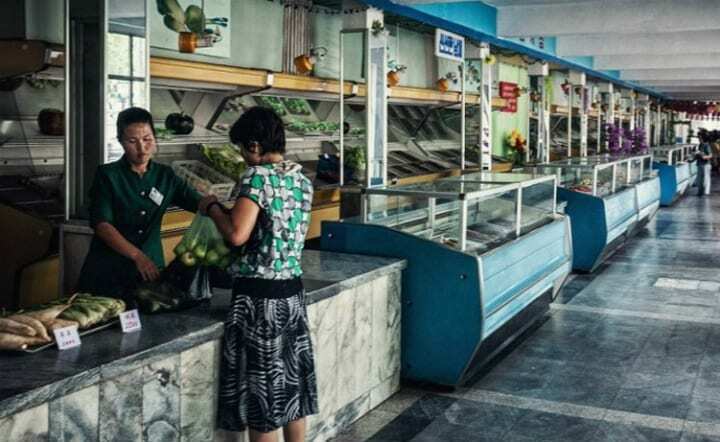 This picture paints a scene of a rather different and somber grocery shopping experience, and that’s because it was taken in hermit state of North Korea in 2012. It is illegal to take photos in North Korea without the approval of a government guide, but that didn’t stop Michal Huniewicz from sneakily snapping a picture of a North Korean woman shopping at the supermarket in Pyongyang, designated for locals only. The sad truth is that the place is empty and the shelves devoid of any fresh produce minus a few turnips, leeks, and apples. 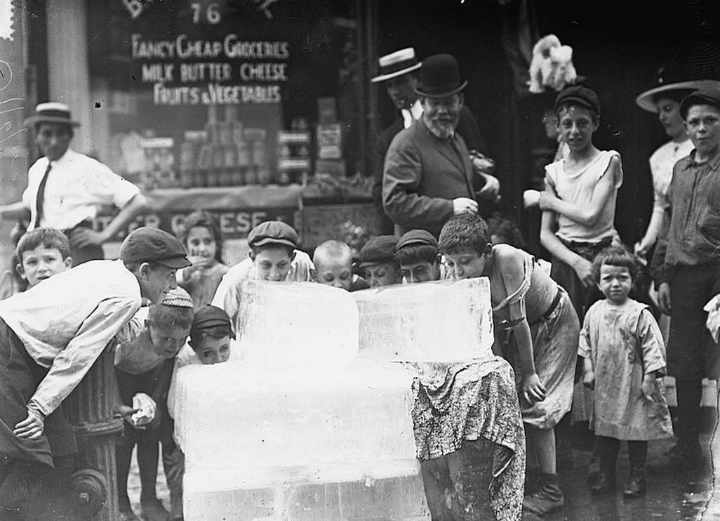 To cool off from a hot summer’s day in 1912, these kids gathered on the sidewalks of New York City to quench their thirst on some large blocks of ice placed next to the local grocery store. This will really make us appreciate the modern marvel of air conditioning! The adult overlooking them in amusement must have been really hot in that suit and top hat! Let’s hope the children’s tongues didn’t stick to the ice blocks! What’s even more amusing is the sign on the store window reading: “Fancy Cheap Groceries.” Whatever it was that the shop placed in its milk, butter, and cheese must have been really delicious. 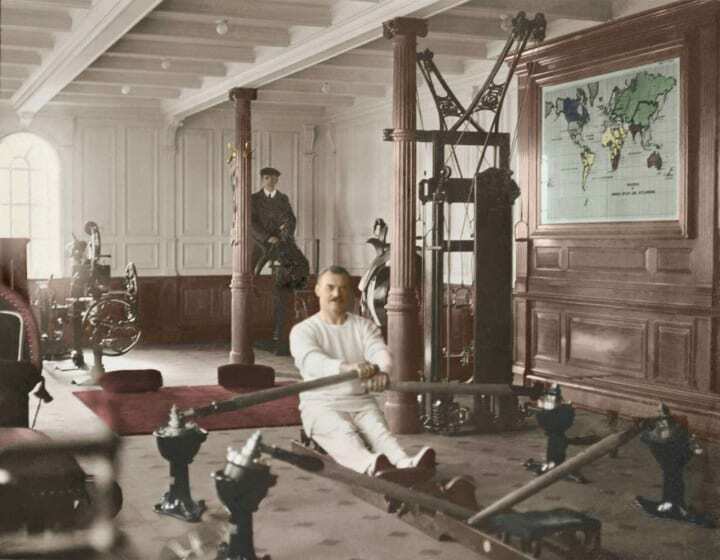 Pictured here are men making use of the state-of-the-art rowing machine and the electric horse on the RMS Titanic, which sadly sunk to the bottom of the ocean on April 14, 1912. Only first class passengers had the privilege to enjoy a workout in the gym and use the latest equipment of the time. One of the passengers, Colonel Archibald Gracie, frequented the gymnasium every day during Titanic‘s short-lived voyage and often spoke about it in interviews after the sinking. The White Star Line’s majestic Titanic ocean liner was the most luxurious ship of its time, often called a floating hotel. These cowboys gathered outside a tavern in 1883 in North Platte, Nebraska aren’t just your average men. They formed part of Buffalo Bill’s Wild West troupe, a company that traveled around America and the world to perform vaudeville shows about the Wild West. 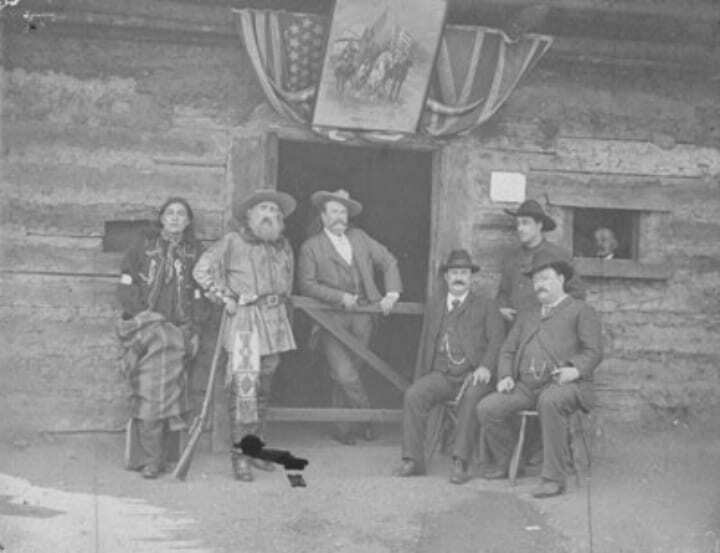 Posing for the camera are William Frederick “Buffalo Bill” Cody, the founder of the troupe, along with the general manager John Burke, a Sioux Native American, and some other dapper cowboys. Burke used innovative billboards, products, publicity stunts, and celebrity endorsements to promote their show. Now this isn’t something you see every day! 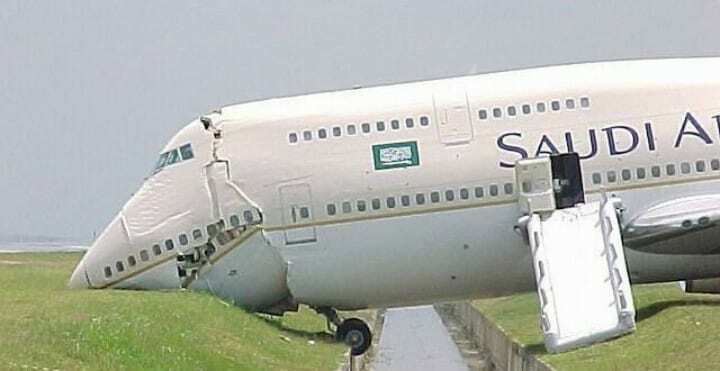 This Boeing 747, operated by Saudi Arabian Airlines, rolled into a drained ditch owing to a serious malfunction on August 23, 2001. As a result, the aircraft careened forward, causing severe damage to the nose of the airplane. The accident occurred when the airplane was being taxied to the passenger loading terminal at Kuala Lumpur International Airport in Malaysia to pick up 319 passengers who were headed for Jeddah, Saudi Arabia. There were maintenance issues with steering and brakes, so the aircraft went headfirst for the ditch. 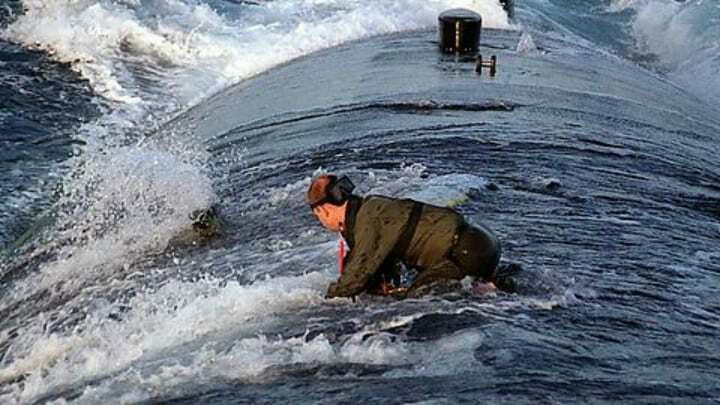 Kim Jong Un kept on top of things, literally, when he inspected some of the North Korean army’s troops in 2012. 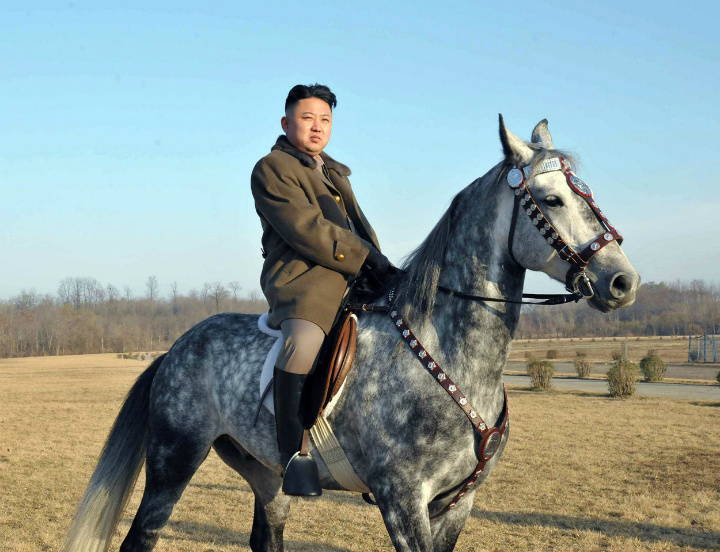 He rode on horseback, pictured here at an undisclosed location, to make ensure everything was running in tip-top shape. While things in North Korea are kept extremely secretive to outsiders and it’s extremely rare to know what’s really going on in Pyongyang, an amusing picture like this one shows how the hermit kingdom’s dictator really wants to be viewed in the eyes of the world. Captured here are men working on the head and torch-bearing arm of the Statue of Liberty at the Gaget, Gauthier & Co. workshop in France. A year before she was dedicated, the Statue of Liberty arrived in New York port via a French ship which held the disassembled statue on board. The Statue of Liberty was gifted to the Americans by France on October 28, 1886. It was supposed to be completed in 1876 to celebrate the United States’ centennial, but lack of funds on both sides of the ocean slowed the process down. Before the robed goddess was dedicated to the people, a lot of men worked hard in a joint American and French effort to get her ready. 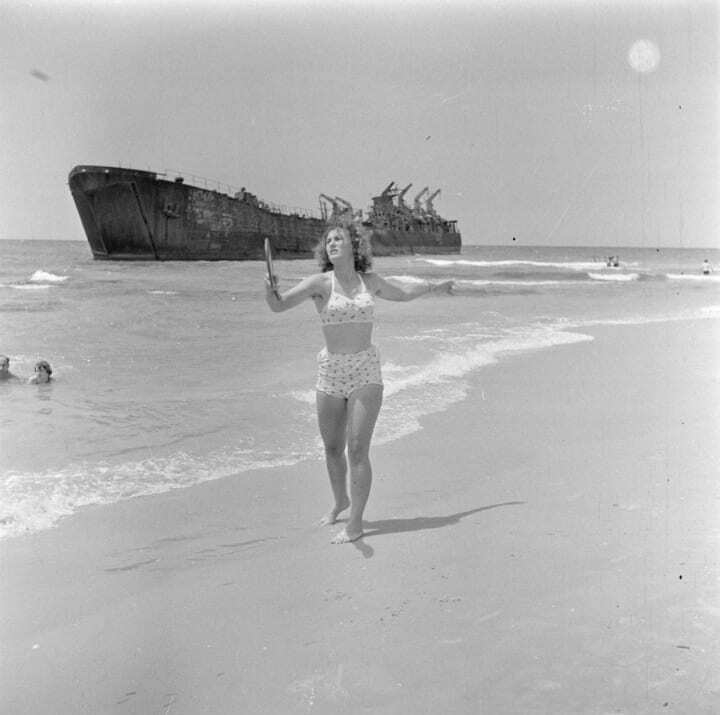 This would be a lovely photo of a woman playing paddle ball at the beach in Tel Aviv, Israel in 1948 if not for the shell of a ship floating in the sea behind her hauntingly. In this year, Israel had just declared independence and was in the throes of war. Sadly, the ship behind her, called the Altalena, was decimated as a result of infighting between a number of Israeli paramilitary and political groups, all struggling to become the dominant ones to run the country. There were rumors those left aboard were trying to start a military coup and so the Israel Defense Forces fired upon it. Sixteen people were killed. The burnt-out boat floated in the busy beach’s waters for a year, even becoming a tourist attraction, until it was finally sunk out at sea. Despite his tough-guy appearance, fear not of Maurice Tillet, otherwise known as The French Angel. In the 1940s, he was a World Heavyweight wrestling champion and one of the most famous wrestlers of his time. He achieved success despite suffering from a life-altering condition. 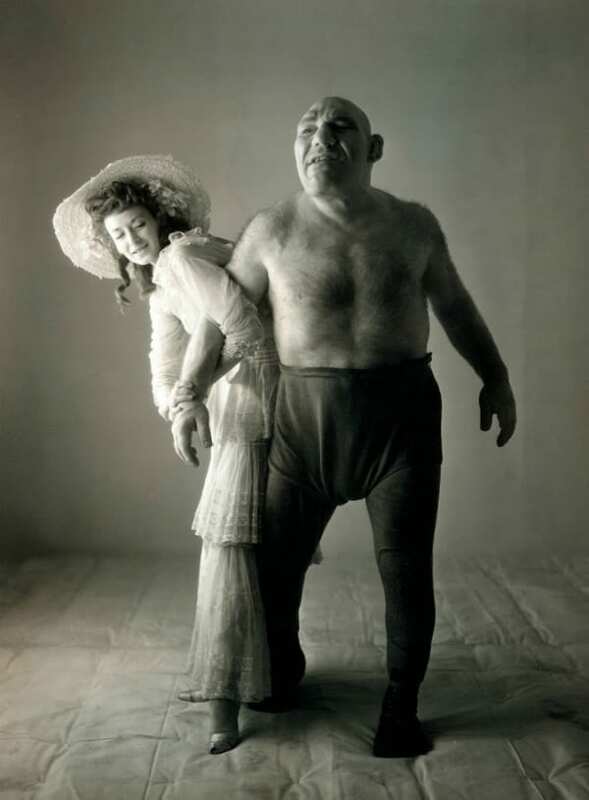 Maurice Tillet had a condition called acromegaly, which caused his head, hands, and feet to swell at the age of 20. When Maurice Tillet was 34, a former wrestler convinced him to enter the profession and he went on to find success. The looks of disappointment on the fans faces say it all. 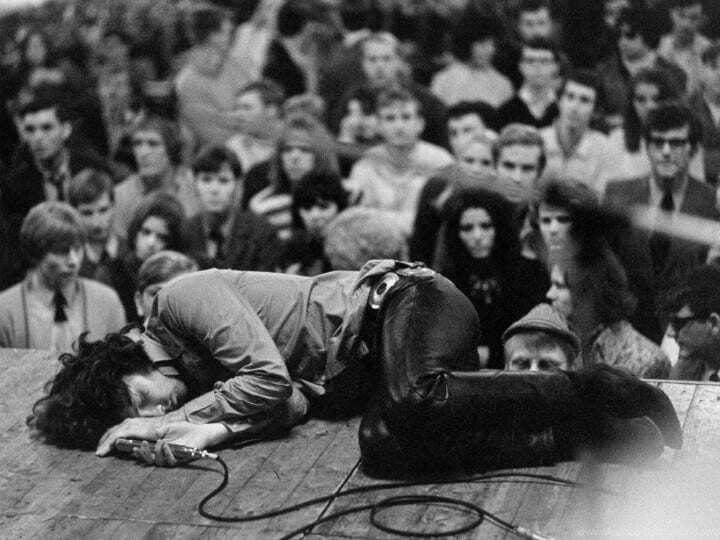 They were probably excited to finally see The Doors perform live in Amsterdam in 1968, but it seems that lead singer Jim Morrison went too wild before the show got started. According to the reports, Jim Morrison had consumed quite a heavy amount of herbal substances while touring the city earlier that day. When he finally stepped onstage, he was in an incredibly altered state, twirling around before passing out. The band continued without him as he was taken to the hospital (and released the next day). Despite Jim Morrison’s absence, fans reportedly loved the show. Audrey Hepburn was often spotted around town with her Yorkshire Terrier, Mr. Famous, but sometimes her pet baby deer Pippin joined too. It all started in 1959 for the filming of Green Mansions when the animal trainer on set told Hepburn to take the baby deer home. The trainer thought it was a good idea for the actress to adopt the deer as her sidekick so she would learn how to follow her, and the rest was history. 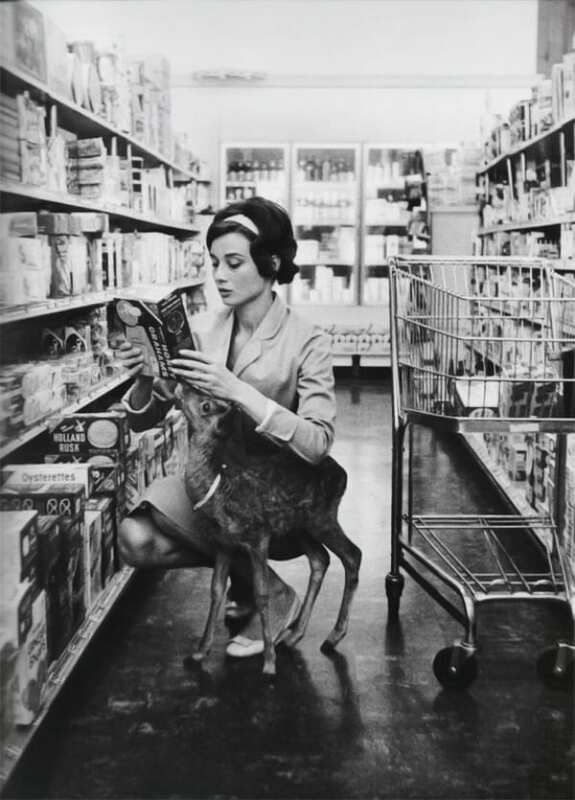 Hepburn called her Pippin, Ip for short, and took her everywhere, even to the supermarket in Beverly Hills. She also made a custom-made bathtub for her beloved fawn to sleep in. Who hasn’t dreamt of what it must be like in the great vastness that is space? 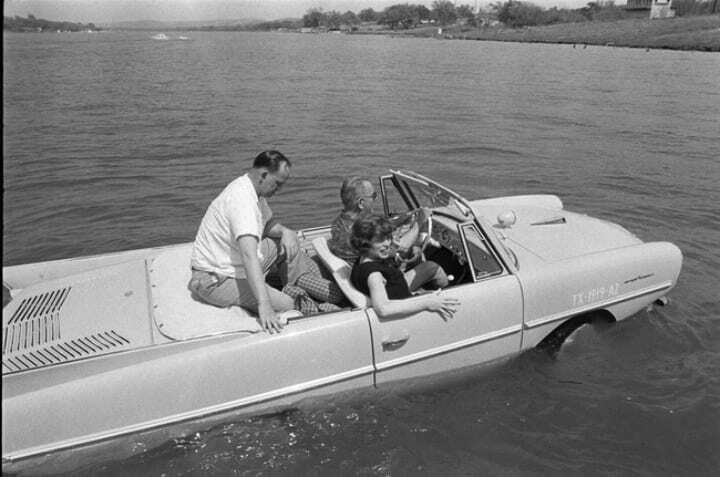 That curiosity turned into a fevered craze in the 1950s and 1960s, otherwise known as the “space age”. These kids were product of the national obsession with winning the Space Race. 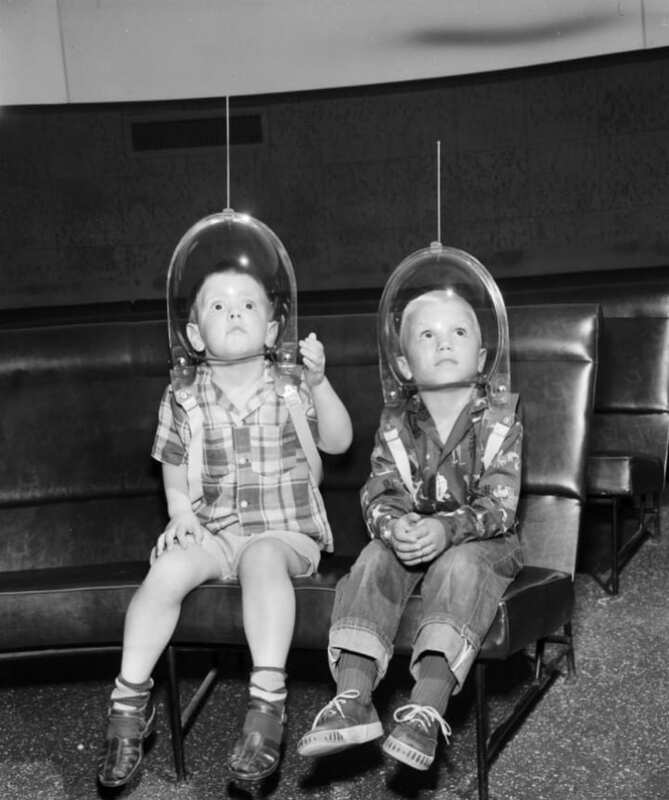 These two adorable boys are pictured at a planetarium in Fort Worth, TX in 1955 and were so excited to learn about space and the solar system, that they donned special space helmets just for the occasion. Let’s hope they managed to pursue their dreams! Dummies are the preferable options when testing out a dangerous stunt. Not so in this case. Pictured here is something so unique and revolutionary for its time that it seems only a live person could show just how effective it is. This invention was the helmet. 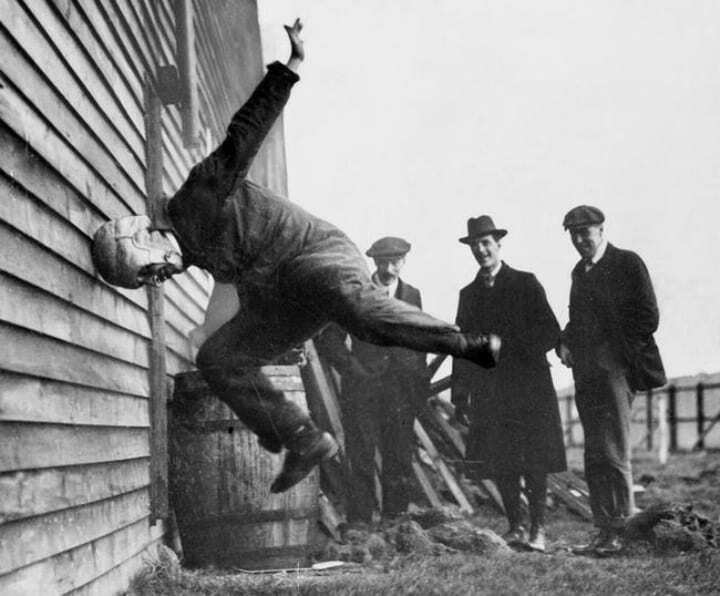 The photo above was taken in 1912 as the jumping man was trying out a prototype of the first helmet. These early helmets were made of several layers of hard leather. Before this, it was rare of athletes to use any sort of protective gear. Why go through the hassle of going to get a massage when you can have a piece of furniture do it for you at home? Possibly that was the thinking behind the person who invented the “hip massage machine”. Looks like fuin. The lady demonstrating the mammoth massage machine in 1928 seems to be having a nice time! Ninety years later, specialized hip massage devices have become small and fit on the back of a chair, like a small support cushion. Technology certainly has come a long way. Presidential inaugurations in the US are traditionally held with much fanfare in front of Capitol Hill and the entire nation. If Lyndon B. Johnson had ever dreamt of being president one day, it’s certain this was not how he imagined it would happen. His inauguration was one of the saddest in all of American History, coming right after President John F. Kennedy was assassinated on November 21, 1963 in Dallas, Tx. 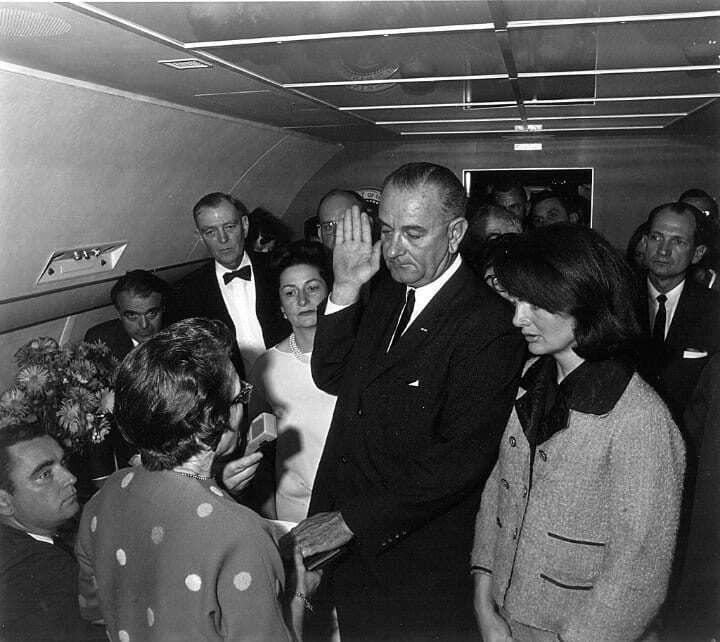 It took place on Air Force One, only two hours and eight minutes after Kennedy was shot. When Americans were looking for new prospects and adventure in the 19th century, the Wild West was the place to go. It was undeveloped, lawless and for the ruthless businessman, a potential place of opportunity. However, not many women were keen on this kind of adventure. 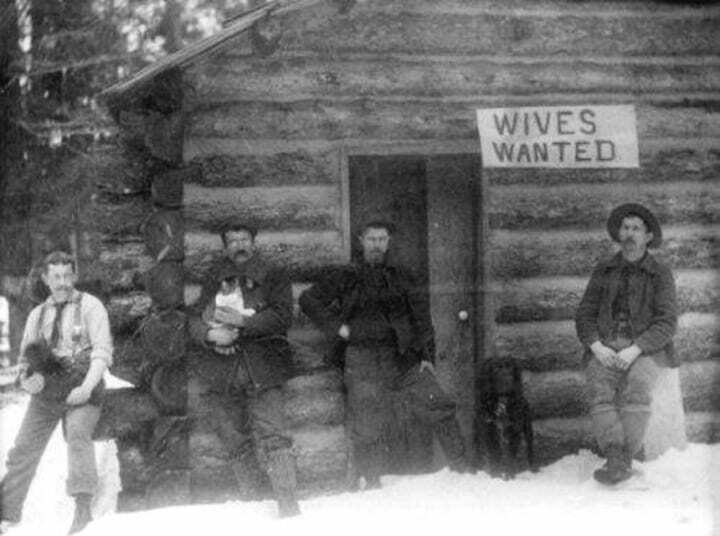 For that reason, the men pictured were so desperate to find women to join them on their ventures that they posted a sign on their log cabin saying “wives wanted”. The concept of “mail order brides” developed because of this need. The threat of chemical warfare was all too real during World War II and as such, adults and children alike had to take special measures. In Britain, gas masks were distributed to all people and it became mandatory to carry them at all times. 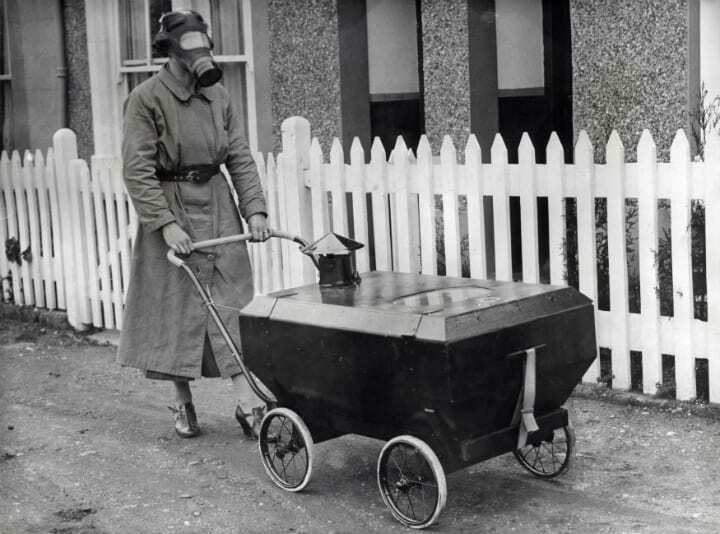 For that reason, this frightening-looking gas mask pram was invented and aimed to keep the baby as comfortable and safe as possible in the event of an attack. To make sure people were well prepared, the government held regular drills with tear gas. In the 1930s, the newspaper industry felt increasingly threatened by a brand new technology that was becoming extremely popular: radio. People were tuning in for free and frequent news and entertainment, so who why buy a newspaper anymore? The “radio facsimile device” was invented to hopefully solve this quandary. 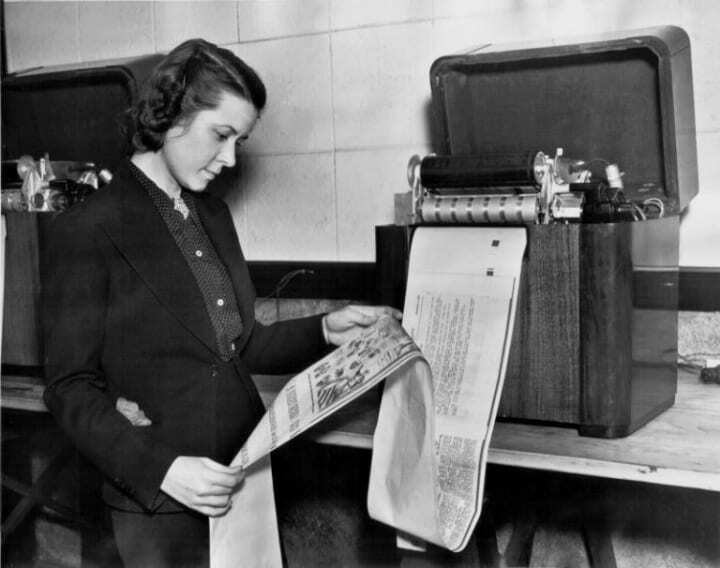 The RCA radio facsimile device pictured here in 1938 is the technology that we know today as a Fax machine. Each machine cost between $125 and $260, which was exorbitant for most during the Great Depression. Even more, it could only print three pages per hour. 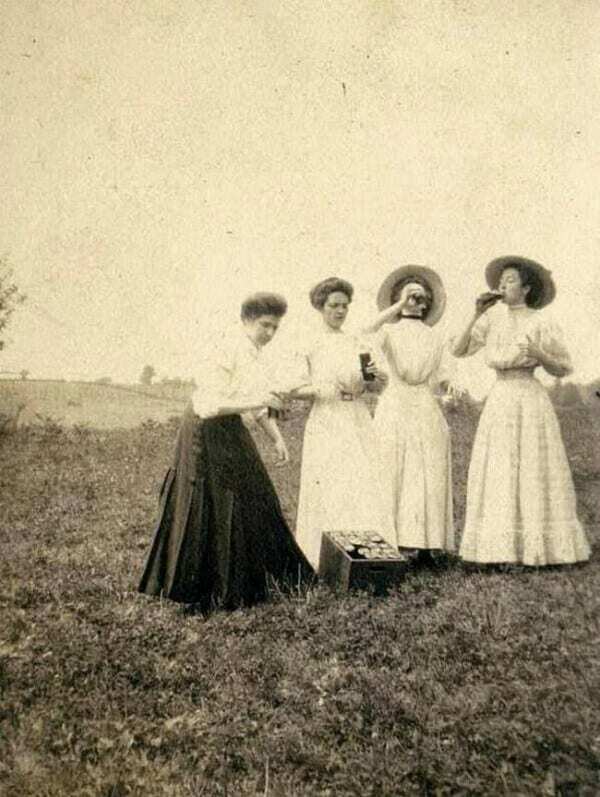 The picture reportedly shows teachers in 1910 enjoying a refreshing drink while spending the day out in nature. It seems that even back then, ladies knew how to chill out and kick back a cold one with the girls. Who was watching the students, though? What makes the photo especially interesting is that the women are dressed so elegantly yet drinking their beverages as if they were having a chugging contest. Definitely unexpected behavior for people looking so prim and proper! But hey, maybe they were very thirsty. Thought that portable technology was something new? 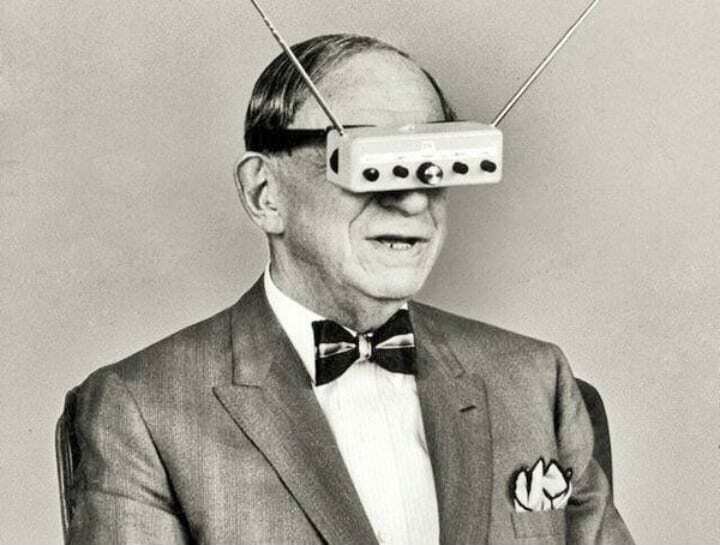 Nope, this isn’t an early version of Virtual Reality glasses. They are a pair of television goggles released in 1963 by inventor, writer and publisher Hugo Gernsback. Gernsback ended up being light-years ahead of his time. 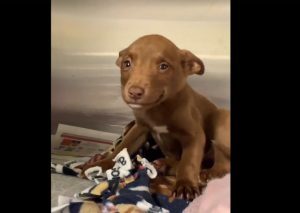 If you enjoyed this story, please SHARE with your friends!